Click here to use the Crop Basis Tool. 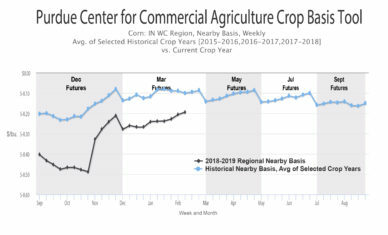 The Purdue Center for Commercial Agriculture’s Crop Basis Tool can be used to examine weekly nearby and deferred basis for corn and soybeans in Illinois, Indiana, Michigan, and Ohio. Daily cash price data from individual grain elevators and processors are averaged within each crop reporting district to create a regional average cash price series. The regional average cash price data is used to compute weekly basis (cash price minus futures price) for corn and soybeans, using Wednesday cash and futures prices to generate weekly basis data for each crop and crop reporting region. The number of buyers vary by crop reporting district and by week, depending on how many buyers choose to report their cash prices. Cash price data are provided by DTN and represent approximately 2,000 buyers across the four states.